The Gospel of John Bible Study Series unveils a revealing and profound perspective of Who Jesus the Christ is, and what our relationship to Him and in Him is to always be. This discerning study and format is designed to be suitable for individual daily study, for couples and family daily study, as well as for weekly group studies. The Gospel of John study offers an opportunity for both personal and group growth and maturation in ones knowledge, understanding, and wisdom of God’s Will for our lives through the Person of Jesus the Christ the Son of God. Here's how this blessed journey of faith and study can work for you: First, you read the assigned passage(s) from this Bible study - usually a single chapter. Then pray and meditate on them for a day, seeking God’s Divine inspiration and understanding through the guidance of the Holy Spirit of God. For the next five days you answer the 2-3 daily questions on your own. And finally, on day seven you meet with others to discuss and compare your answers. If you are doing an individual study we offer to share our answers with you after the study of each chapter. Finally, submit your answers and review to us for input and guidance. Upon the successful completion of each chapter of the Gospel of John Bible study there are short essay questions, and at the end there is a review. You are asked to write a testimonial essay (a personal testimony of faith) that you may share with us and others. The daily discussions and interactions with the Gospel of John Bible study are really powerful in small journey groups. They provide you an opportunity to share what you learned, and you can gain powerful insights and understanding from others. Remember, the Holy Spirit works in all those who believe, and you can learn a lot from the insight of other believers, and they from you. While we recommend that you first complete the Gospel of John Bible study lesson by yourself, this study format works great with couples, families, small groups, youth groups, and Sunday school classes. Passages can be assigned the week prior from the website. They typically cover a chapter of the Book of John. Each of the weekly lessons in this Gospel of John Bible study is designed to enrich you, as well as to challenge you to learn the Truths presented by this Sacred Word that you may become a faithful servant leader and witness to all in God’s Kingdom work. We encourage you to discuss and share your insights with others of Faith. This is a rewarding and enriching way to study the Gospel of John. The study also provides a great format to learn Biblical Truths that each of us can apply in our daily lives and walk of Faith. The process involves "personal application" questions where you discern and reflect on your life experiences, and share the impact of these Biblical Truths on your personal life with others in your group. This study also offers discerning and challenging questions for those of you who wish to dig deeper into their walk of Faith in Jesus the Christ our Lord and Savior. The purpose of this study is to enable the learners to share in depth personal insights, to explore all twenty-one Chapters of the Gospel of John with other seekers and believers, and to benefit from group discussions of Biblical Doctrines and Principles. The studies questions have been designed to prompt you to inter-textually discern and to analyze the facts regarding what is actually written (the Doctrine of God vs. the doctrines of man). Other questions will guide you to discover a deeper meaning or context of the passage. Our inter-textual approach to the Bible study is designed to help you to discover life lessons from the Biblical Doctrines and Principles we are studying in John’s Gospel. We do not claim to have all the answers, and nobody expects you to have them either. However, we can learn from each other’s insights, and we can learn more about the life of Jesus the Christ the Son of God through this insightful study. Our purpose in this study, as fellow sojourners of Faith, is to learn from God's Sacred answer Book - The Bible. In doing so, our rewards are eternal, and the lessons learned can be applied to our everyday lives. Let us begin this enriching journey! Feedback on this Weekly Bible Study Series of the Gospel of John is welcomed and encouraged! All glory, praise, and honor be to God our Father, Jesus Christ our Risen Lord, and the Spirit of Holiness which inspired these writings! My special heartfelt thanks to my wife, our 7 children, our 9 grandchildren, our family, our friends, and colleagues of Faith for their prayers, support, and inspiration as fellow sojourners of Faith in the writing of this Biblical Study Series of the Testimonies and Writings of the Apostle John. Overview – We begin our journey of Faith and Study into the Gospel of John with a brief overview of the Apostle John’s purpose in writing this beautiful and Sacred Gospel. The purpose according to John in found in John 20:31: “These are written that you may believe that Jesus is the Christ, the Son of God, and that by believing you may have life in His name.” The Doctrine herein is “Salvation”, and salvation is of God the Father through Jesus the Christ His beloved Son. Other key doctrines that are revealed herein are the Person of Jesus the Christ, the Work of Jesus the Christ, and the Holy Spirit which proceeds from God the Father and Jesus the Christ the Son. The Author of the Gospel of John: John the Apostle was born the son of Zebedee and he was the brother of James. Authorship of this beloved and inspiring Gospel is traditionally attributed to John whom is described in the Gospel of John 21:20, 24 as the “disciple whom Jesus loved.” The Gospel of John itself does not name John as the author. John is credited with the authorship also of the Epistles of 1 John, 2 John, 3 John, and the Book of Revelation of Jesus the Christ. The Apostle John was among the “inner circle of three” of Jesus the Christ. He is always mentioned in the first four of the list of the twelve Apostles. The Apostle John was an eyewitness to Jesus’ life, ministry, death, resurrection, and ascension, thus this makes his testimony and witness invaluable. The Apostle John’s Gospel writing is selective, evangelical, and focuses on the identity of Who Jesus the Christ is (John1:1-14). John was the last of the Apostles to die, and the only one who is known to die a natural death. The Apostle John’s last writing, the writing of the Book of Revelation of Jesus the Christ was dictated to him by the Lord Jesus the Christ on Patmos while he was imprisoned there. Date of the Writing of the Gospel of John: Dating of the Apostle John’s Gospel writing ranges from A.D. 40 to A.D. 110, thus depending on one’s sources and resources. The Structure of the Gospel of John: The Gospel of John is traditionally divided into two parts or themes: Chapters 1-12 are commonly referred to as “the Book of Signs,” and Chapters 13-20 are commonly referred to as “the Book of Glory,” with Chapter 21 being often referred to as the appendix or second ending to the Gospel. John 1:1-51, The Prelude to the Ministry of Jesus the Christ: Part 1, the prologue (John1:1-18), begins a poetic celebration of Jesus the Christ origin with God and His coming into the world. Part 2, a narrative prologue (John1:19-51), narrates the witness of John the Baptist to Jesus the Christ (vv. 19-34) and the gathering of the first disciples (vv. 35-51), the unfolding of Jesus’ ministry. John 2:1-5:47, Jesus’ Words and Works: “Greater Things”: These chapters contain miracles and discourses by Jesus which point to the authority and source of Jesus’ Words and Works, the Wine Miracle at Cana (2:1-11); the Cleansing of the Temple (2:13-22); two Healing Miracles (4:46-54, 5:1-9); Jesus’ conversation with Nicodemus (3:1-21; Jesus’ conversation with the Samaritan woman at the well (4:4-42). We read of Jesus’ promise to reveal “greater things” to His disciples (1:50). Herein is the first conflict with the Jewish authorities (5:9-47), a conflict which includes a decision to kill Jesus (5:18).These section of the Gospel reveal the themes and tension therein that characterize Jesus’ public ministry in The Gospel of John from the manifestation of Jesus’ glory (2:1-11) to the rejection of that glory (5:9-47). John 6:1-10:42, Jesus’ Words and Works: Conflict and Opposition Grow: These next Scriptures follow the same pattern as the first group, thus beginning with a miracle in Galilee, the feeding of the five thousand (6:1-15). This section of Scriptures concludes with hostility towards Jesus and the renewed intention to kill Him (10:31-39). Herein it is revealed that the hostility towards Jesus increases gravely. John 11:1-12:50, The Prelude to Jesus’ Hour: It is herein that we find a bridge from Jesus’ public ministry to His public execution (John 13-19). John11-12 stand as a prelude to Jesus’ hour. John 13:1-17:26, The Farewell Meal and the Words of Jesus: john13:1 herein signals a new orientation in the Gospel narrative, that of Jesus’ hour, the time of His impending death, His resurrection, and His ascension. John’s Gospel narrative focuses now on the foot washing (13:1-20), Jesus’ farewell discourse (14:1-16:33) and prayer (17:1-26), and provides the framework for theologically interpreting and understanding the remainder of John’s Gospel. John 18:1-19:42, “The Hour Has Come”: Jesus’ Arrest, His Trial, and His Death: Herein these two chapters are the theological and narrative heart of John’s Gospel of Jesus’ “hour.” He is portrayed as the true Lamb of God, the Good Shepherd, Who willfully lays down His life for those He loves in obedience to the Will, the Way, and the Word of God the Father. John 20:1-31, The First Resurrection Appearance: Jesus’ “hour” consist of His death, His resurrection, and His ascension. It is not until Jesus returns to be with the Father in Heaven that His “hour” is completed (20:17). John 21:1-25, Jesus’ Resurrection Appearance at the Sea of Tiberius: Jesus’ resurrection and ascension points toward the future life of the believing community of Faith and its continuing witness to Jesus the Christ the Son of God. Now that you have completed an overview of the Gospel of John, the authorship, and his purpose of the Gospel, before you begin the Weekly Study, you need to pre-read the entire Gospel of John over the next five to seven days (3-4 chapters per day). After you complete your preliminary reading you will be ready to begin the in-depth chapter-by-chapter, verse-by-verse Bible Study Series of this beautiful Gospel. Chapter One - Chapter One unveils what are the most beautiful passages in Holy Scripture. Jesus’ Deity is declared (1:1-5), Jesus’ humanity is established, and He is declared the “Only Begotten Son of God” (1:14-18), and He is proclaimed by John as “The Lamb of God Who takes away the sins of the world” (1:29-34). Jesus calls the first of His twelve disciples (1:35-51). As you read through each of the verses of the Gospel of John, also read the corresponding Bible verses given herein. This process will give you an inter-textual solid understanding of the Gospel’s message and intent [Holy Scripture testifying of Holy Scripture – Jesus says, “… and these are they which testify of Me.” John 5:39]. In verses 1-5, Who is the Apostle John proclaiming in these verses? What is the significance of John’s declaration? In verses 6-13, What is John’s purpose in these verses? What is his message? In verses 14-18, What is the significance of John’s proclamation regarding the Word to you as a believer? In verses 19-28, Who does John declare himself to be, and which prophet of old prophesied of John’s coming? In verses 29-34, What is the significance of Jesus being declared the Lamb of God? John baptizes with water, and Jesus the Christ baptizes with the Holy Spirit. What is the meaning and the significance of each and how are they different, yet connected? In verses 35-51, Who are the first to be called to discipleship and to faithfully respond? What is the significance of each one’s call? Write a short essay regarding your understanding and your insight of Chapter One, and what each highlighted point means to you. Chapter Two - In Chapter Two of the Gospel of John we see Jesus perform his first miracle, “Jesus turns Water into Wine” (2:1-12). Next we see “Jesus cleanse the Temple” (2:13-22). We also learn that Jesus is “A Discerner of Hearts” (2:23-25). As we study this chapter of the Gospel of John we will begin to see Who Jesus is and His passion for God’s Will to be done here on earth as in Heaven. Jesus presents seven signs in the Gospel of John. Herein these verses Jesus’ first sign is what? What does it demonstrate? What is the response of His disciples? What does it mean in verse 6 ‘according to the manner of purification’? Why is that significant? In verses 6-10, Where did these events take place? In verse 13, What is the significance of the Passover Feast and celebration? Why was Jesus so angry at the merchants in the temple? Was His anger justified? Why was He angry, in verses16-17? Do we see these things taking place today in sanctuaries and temples of worship around the world? Has God’s Sacred Word and places of Worship become a merchants undoing and defiling of God’s Will ? What is the significance of verses 18 and 19 to believers? In verses 23-25, What does it mean to be a “discerner of hearts”? What allows Jesus to know the thoughts of man and to look into their hearts? Write a short essay regarding your understanding and your insight of Chapter Two, and what each highlighted point means to you. Chapter Three - Chapter Three of the Gospel of John contains the most famous or well-known verse of Scripture in the world today: “For God so loved the world that He gave His only begotten Son, that whosoever believes in Him shall not perish but have everlasting life” John 3:16. Jesus said this, and what does it mean for those who believe? Note: Please read these passages thoroughly and meditate upon them, that they may be forever placed in the annals of your mind, and written upon your heart [Psalm 1:1-6]! Chapter Three Short Essay Questions. In verses 1-21, Who is Nicodemus, and why is his encounter with Jesus significant? Do we have church leaders today like Nicodemus? In verse 3-8, What does it mean to be born again? What does it mean to be born of the water? Why is it important that we believe in Jesus the Christ the Son of God? What happens to those who believe in Jesus the Christ the Son of God? In verses 17-21, Why do people refuse and deny Jesus the Christ the Son of God? What happens to those who refuse and deny Jesus the Christ the Son of God? Does Jesus baptize those who come to Him, or does He just proclaim the Good News to those who come to Him? If yes, With what does He baptize believers? Why is this significant? What does John mean in verse 30? From Whom does Jesus get his authority and Whose Words does Jesus speak? Into Whose hands has the Father given all things, and Why? Write a short essay regarding your understanding and your insight of Chapter Three, and what each highlighted point means to you. Chapter Four - Chapter Four of the Gospel of John gives us the story of the woman at the well. This is such a deep and beautiful story about God’s Truth and how our worship of Him is to be in our daily walk of Faith. Study the woman's phenomenal conversation with Jesus and explore her emotions as she wonders about the most interesting and perceptive man she was ever to meet, Jesus the Christ. Verses 23 and 24 should be memorized and placed into the annals of your mind and written upon your hearts. Chapter Four Short Essay Questions. In verses1-8, Why did Jesus leave Judea for Galilee? In verse 9, Why was it considered strange or unusual for Jesus to speak to a Samaritan woman? In verses 7-12, What is the significance of Jacob’s well? In verses 13-15, What is the “living water” Jesus speaks of, and from where does it come? Why is this woman’s testimony of Jesus important to those she speaks to? What is their response? In verses 19-24, What does Jesus say about our worship of God the Father? Why is Jesus’ speech significant regarding the worship of God the Father? Who does Jesus say He is in verses 25-26? In verses 34-38, What is the “whitened harvest,” and who participates? Why? In verse 42, Who declares Jesus to be the Christ, the Savior of the world, and why? In verses 43-45, Why does Jesus testify that a prophet is without honor in his own country? In verses 46-54, What is the second sign or miracle Jesus does? Why is it significant? Write a short essay regarding your understanding and your insight of Chapter Four, and what each highlighted point means to you. Chapter Five - Chapter Five of this beautiful Gospel gives us another sign and miracle from our Lord Jesus – the healing of the invalid man by the Pool of Bethesda. Does the invalid man who was healed persecution end with his healing? His story is also our story as sojourners of Faith, revealing that being a believer in Jesus the Christ does not exempt us from persecution of those who reject Him. In chapter five Jesus the Christ discusses His relationship with the God the Father in Heaven, and to prophesy of Sacred Scriptures which testify of Him [John 5:39]. Chapter Five Short Essay Questions. In verses 1-15, What was Jesus’ third sign and/or miracle in the Gospel of John? Was the one healed a person who exercised faith? Did he know Who Jesus was at the time of the healing? Did the Law of Moses forbid healing on the Sabbath, or was the Jewish religious order’s interpretation of the Law which forbid such good works? (Doctrine of God vs. doctrines and traditions of man) Note: Who is the Lord of the Sabbath? Is God’s Sabbath for all His creation or for the Jews only (according to Sacred Scripture)? What was Jesus’ seven point response to His relationship to God the Father in verses 19-30? Whom does Jesus say testifies of Him in verses 31-47? Why is this so important? (Four Witnesses to Jesus as the Messiah and the Son of God) What is each One’s testimony of Jesus? To Whom has God the Father given authority and power to judge the good and the evil? Is there a resurrection unto everlasting Life (eternal fellowship with God)? Is there a resurrection unto everlasting condemnation and death (eternal separation from God)? Who goes where and why? Write a short essay regarding your understanding and your insight of Chapter Five, and what each highlighted point means to you. Chapter Six - In Chapter Six of the Gospel of John we read of the great miracles and signs of Jesus the Christ feeding the 5,000, and His walking on the sea. Jesus reveals that He is the “Bread of Life,” and we see the first of the “I AM” statements from Jesus the Christ. We also read of Jesus being rejected by His own. We also hear from one of Jesus’ disciples say, “Also we have come to believe and know You are the Christ, the Son of the Living God.” Study Chapter Six to gain great insight and to learn many answers of Faith, and what it means to be a disciple of Jesus the Christ. Chapter Six Short Essay Questions. In verses 1-14, Where did the feeding of the five thousand take place? What is the significance of this sign or miracle? How much food did Jesus and the twelve disciples start with, and how much food was left over. What did Jesus do with the loaves of bread and fish before distributing them to the multitude? What is the significance of this message to us as believers? What is the significance of fifth sign or miracle of Jesus walking on the Sea of Galilee, the calming of the Sea, and the transporting of His disciples to their destination in verses 16-21? Jesus declares He is the Bread of Life, the Bread from Heaven in verses 22-40. Why is this significant to us as believers? What is the difference between the manna given to eat during Moses’ time and the bread which Jesus the Christ gives us to eat? What does the Lord’s Supper, Holy Communion, signify? Should Holy Communion, the Lord’s Supper, be a part of our daily worship of God our Father in Jesus the Christ His beloved Son? If yes, why? And if no, why? Is this beloved gift, a gift from man or from God? Write a short essay regarding your understanding and your insight of Chapter Six, and what each highlighted point means to you. Chapter Seven - In this chapter Jesus goes to Jerusalem to the Jewish Feast of Tabernacles, one of three major Jewish Festivals. The other two are The Feast of the Passover and The Feast of Pentecost. We learn why Jesus causes such a stir in Jerusalem at the feast. Jesus’ brothers did not even believe in Him in the beginning. The promise of the Holy Spirit of God is given. The religious authorities reject Jesus as the Messiah or as the Christ. Jesus always reminds us that we are not to fear if the world hates us or rejects, for they first hated and rejected Him. Chapter Seven Short Essay Questions. In verses 1-9, Why did Jesus’ brothers not believe in Him? What is Jesus’ response to them? What does Jesus mean in verses 6-9? From Whom does Jesus get His knowledge and understanding of Scripture, and from where does His authority come? How does Jesus address the issue of healing on the Sabbath? In verses 25-31, From Whom does Jesus say He is from? What did the people do? How do the religious leaders of that day react to Jesus’ Words in verses 32- 36? How does Jesus respond? In verse 37-39, Whom is Jesus speaking of, and what is the significance of His Words to those who believe in Him? Why was there division among the people in verse 40-44? When the religious authorities rejected Jesus in verse 45-52, who defends Him and on what grounds or principals? Write a short essay regarding your understanding and your insight of Chapter Seven, and what each highlighted point means to you. Chapter Eight - Chapter Eight of the Gospel of John provides insight into Jesus' discussion with the Pharisees and their displeasure with him. Jesus declares Himself to be the “Light of the world.” Learn more about this insightful proclamation in your study of Chapter Eight. Chapter Eight Short Essay Questions. What is the significance of the lesson(s) Jesus is teaching the woman, and the Pharisees and scribes in verses 1-12? What is the point Jesus is making with the Pharisees in verse 13-19? Why is verse 20 important? Why can’t those whom Jesus is addressing in verses 21-30 go where Jesus is going? Why will they seek Him and not find Him? Why is this significant to us today as believers, and to non-believers? Expand on what Jesus is saying in verses 31-36, “The Truth shall make you free!” What does He mean? What must one do to be set free? What is the significance of Abraham’s seed and Satan’s seed in these passages (vv. 37-47)? What do they both have in common? What is Jesus’ answer to the people? In verse 48-59, Why do the Jews accuse Jesus of having a demon in Him, and being a Samaritan (address each accusation)? What is Jesus’ response and why is it important? What is the significance of Jesus’ statement in verse 58? Write a short essay regarding your understanding and your insight of Chapter Eight, and what each highlighted point means to you. Chapter Nine - Another great story of healing occurs in Chapter Nine of the Gospel of John with Jesus the Christ’s healing a man born blind. John reveals to us that even though we are healed of our sins and transgressions, the world will still continue to persecute us as the man healed in this chapter was persecuted by the Pharisees afterwards. Herein, Jesus speaks about the contrast between True Vision and true blindness in this amazing story. Chapter Nine Short Essay Questions. Why do the disciples of Jesus ask, ‘Who sinned, this man or his parents, that he was born blind?’ in verses 1-2. What was Jesus’ answer? What caused the healing of the man’s blindness? Why are the Pharisees blind according to Jesus? Why are the parents reluctant to openly testify of Jesus’ healing of their son? In verse 30-33, Who does the healed man say Jesus is, and from where does he say Jesus comes? Why? Why did the Pharisees cast the healed man out of the synagogue? Who does Jesus say He is in verses 35-41, when talking to the healed blind man? What does Jesus say to the Pharisees about blindness and sight in verses 40-41? What does that mean? Write a short essay regarding your understanding and your insight of Chapter Nine, and what each highlighted point means to you. Chapter Ten – In the Gospel of John, chapter ten, Jesus the Christ is revealed as The Good Shepherd. Jesus causes much controversy in Jerusalem. The Jewish religious leaders surround Him and ask Him to tell them plainly if He is the Messiah, the Christ. Learn what Jesus tells them about role of the Good Shepherd Who willfully lays down His life for you and me, His sheep. As you read, hear the voice of the Good Shepherd as He speaks to you through His Sacred Word under the Divine inspiration of the Holy Spirit. Every pastor and minister needs to take these passages to heart, thus discerning whether they are true shepherds of their congregations or mere hirelings. Chapter Ten Short Essay Questions. In verses 1-6, Who is the Door? Who is the thief and robber? What is Jesus saying herein? Who is the Good Shepherd? I verses 7-21, what is the difference between the Good Shepherd and the hireling and or thieves? What happens when trouble comes – the Good Shepherd? – the hireling? From Whom does Jesus receive His authority and power? In verses 22-30, what bears witness of Jesus? Who hears Jesus’ voice, and why? What does Jesus give His sheep? From Whom does Jesus get His power and strength? Why do the Jews continue to attempt to stone Jesus to death in verses 31- 39? What is Jesus’ response to them? What is the significance of verses 40-42? Write a short essay regarding your understanding and your insight of Chapter Ten, and what each highlighted point means to you. Chapter Eleven - Chapter Eleven of the Gospel of John gives us the remarkable record of Jesus the Christ raising Lazarus from the dead. It demonstrates the compassion and power of Jesus and the evil intent of the Pharisees. Also, the shortest verse in the Bible is found in this Chapter. Do you know which verse it is? Chapter Eleven Short Essay Questions. Why do think Jesus purposefully delayed coming to Lazarus in verses 1-44? What does Jesus mean in verse 4? What is the message in verses 11-15? Who is the “Resurrection and the Life”? What does that mean to you as a believer in Jesus the Christ? Whom does Jesus say is to be glorified in the raising of Lazarus from the dead in verses 40-44? Why do the Jews seek to kill Jesus if He is the Messiah? What is the “Passover Feast”? From where does it originate? I it still valid today, why? Explain! Write a short essay regarding your understanding and your insight of Chapter Eleven, and what each highlighted point means to you. Chapter Twelve – In Chapter Twelve the Gospel of John reveals the story of the Mary anointing Jesus feet at Bethany, a plot to kill Lazarus (means: one who God helps) whom Jesus raised from the dead, followed by the prophetic Triumphal Entry of Jesus Christ into Jerusalem, Jesus predicting His impending death, and Jesus’ revelation by Whose authority He speaks. Why do you think Jesus came to Bethany to celebrate Passover, and who was there of significance in verses 1-2? Mary’s anointing of Jesus’ feet signified what, and how she anointed His feet signified what in verse 3? What was Judas’ reason for objecting to the anointing of Jesus by Mary in verses 4-6? What was Jesus’ response in verses 7-8? Why do the Jews plot to kill Lazarus in verses 9-11? What is important about verses 12-19? Who prophesied of such in the Old Testament? Explain the parable of the “Fruitful Grain of Wheat” which Jesus spoke of in verses 20-26. What does Jesus say about his hour coming in verses 27-36, and Whom shall be glorified? What are we to do as believers? In verses 37-41, what is the meaning and significance of Isaiah’s quote? Who believes in Jesus and who does not in verses 42-43? Why? What does Jesus have to say about one’s belief and one’s walk of faith in Him in verses 44-50? Write a short essay regarding your understanding and your insight of Chapter Twelve, and what each highlighted point means to you. Chapter Thirteen – In Chapter Thirteen of the Gospel of John Jesus reveals the true definition of a servant leader as Jesus the Christ washes the feet of His disciples at the Last Supper, and of Jesus’ betrayal by one of His disciples, Judas Iscariot. Jesus gives His disciples a New Commandment which is routed in the Old Covenant and the Spirit of the Law. This is followed by Jesus' announcement of his impending departure, and Jesus’ foretelling of Peter’s denial of knowledge of Him. Chapter Thirteen Short Essay Questions. What does Jesus teach each of His disciples, and those who choose be a disciple of Jesus Christ about the heart and role of leadership, servant-hood, and humility in verses 1-17? Who is Jesus’ betrayer in verses 18-30? What does his relationship with Jesus reveal to us about trust and betrayal? Who and what does this man represent? What does Jesus mean in verse 18? What does Jesus mean in verses 31-32? What is Jesus talking about in verses 34-35? Did He do away with the Old Commandments (The Law), or is He expounding upon the spirit of God’s Law, and if so, explain? Are we like Peter in our daily living and our relationship with God, Jesus, and others? Explain! Write a short essay regarding your understanding and your insight of Chapter Thirteen, and what each highlighted point means to you. Chapter Fourteen - This is the first of four chapters in this Gospel of John Bible Study Series where Jesus comforts, assures, and teaches his disciples after the Passover Feast. Jesus answers questions posed by Thomas, Phillip, and Judas (not Iscariot). Jesus herein reveals He is the Way, the Truth, and the Life of the world, and that no one comes to God the Father except through Him, Jesus the Christ. We read that the gift of the Holy Spirit – the Helper from God, the Spirit of Truth and Holiness is promised to all who believe and obey the Will, the Way, and the Word of God. Chapter Fourteen Short Essay Questions. What does Jesus mean in verse 1? In verse 6, what does Jesus mean “I Am the Way? I Am the Truth? I Am the Life”? What does Jesus mean in verse 6, “No one comes to the Father except through Me”? What about Islam, Buddhism, Hinduism, Zin, and other world religions which do not profess Jesus as the Christ the Son of God? What is the message Jesus is revealing to His disciples in verses 7-11? And, why is it important to you as a believer? In verses 12-14, what does Jesus say about prayer? Who is glorified in the process? In verses 15-18, what must we do to show our love of the Father and the Son? Because of our obedience to the Will, the Way, and the Word of God, what will Jesus do for us? What will the Father do for us? In verses 19-20, what does Jesus mean? In verse 21, what does Jesus say about obedience to His Commandments, and which one’s does He exempt us from? What is the outcome of obedience to the Will, the Way, and the Word of God according to this verse? Explain verses 23-24, Jesus’ response to Judas (not Iscariot)? In verses 25-26, Who sends the Holy Spirit in Jesus’ Name, and for what purpose does He come? Explain the “Peace” that Jesus is talking about. In verse 28, why are we to rejoice in Jesus’ departure from this world to the Father in Heaven? What does Jesus mean in verses 29-31? Write a short essay regarding your understanding and your insight of Chapter Fourteen, and what each highlighted point means to you. Chapter Fifteen - This is the second of four chapters in the Gospel of John where Jesus teaches His disciples after the celebration of the “Passover Feast”. Jesus reveals what the relationships of believers to Himself, and to one another is to be, as well as what their relationship to those of the world will be. Jesus also promises to send a Divine Helper, the Spirit of Truth, the Holy Spirit to those who believe in Him and obey His Commandments. Jesus offers the gift of Divine Peace from God, a peace which the world does not know or offer. Chapter Fifteen Short Essay Questions. Read Psalm 80:1-[8-19], then explain what Jesus is saying in verses 1-8 of Chapter 15 regarding the Vine and the Vinedresser, and the branches. Who is the Vine? Who is the Vine dresser? Who are the branches? What do these beautiful verses mean to those who are believers in Jesus the Christ, and to those who deny Him as the Son of God? What does Jesus mean in verses 9-10? What must we do to abide in His love? Why is this point so important? In verse 11, What is to be fulfilled and how? Explain verse 13-15. What it means to you as a believer and to other believers. Address each verse separately and collectively. What does Jesus mean in verse 16-17? What does it mean to bear fruit? Read Matthew 5:1-12, then explain what Jesus is saying in verses 18-25, and how we are to behave when faced with controversy and persecution. Why does He say this is so in verse 25? In verses 26-27, Whom does Jesus send? From Whom does He proceed? Why does He come? To whom does He come? Write a short essay regarding your understanding and your insight of Chapter Fifteen, and what each highlighted point means to you. Chapter Sixteen – This is the third of four chapters in the Gospel of John where Jesus teaches His disciples after the “Passover Feast”. Jesus reveals to the Apostles and those who pick up their cross and follow Him that they will be persecuted for their faithfulness and belief. They are not to worry for they will see Him again in all His glory, and in Him they too will be glorified! He states that He has already conquered the world and they will have no more tears, no more pain, and their sorrows will be turned into joy. He will send them a Helper, the Spirit of Holiness, which will proceed from the Father to comfort, to teach them and to strengthen them in their journey of Faith, of testimony, and of witness to a dark and sinful world. The Helper, the Spirit of Truth will convict (expose) the world of its decadence and sin. Chapter Sixteen Short Essay Questions. In verses 1-4, What does Jesus say about those who will persecute and kill His disciples and followers? In verses 5-15, Where is Jesus going, and why is He going there? What does Jesus say about sin, about righteousness, and about judgment? The Helper that Jesus is sending His believers is called by what other Name? Why is His Name significant then, and in our time? What will the Helper do and by Whose authority does He speak? In verses 16-19, Explain Jesus’ message to His disciples and followers. In verses 20-22, What does Jesus say about the sorrow of His followers, verses the rejoicing of the world regarding Hid departure? Why are these contrasting views? In verse 23-24, What does Jesus tell His followers will happen if they ask of the Father in Jesus’ Name? What will happen? In verses 25-30, What are the disciples and Jesus talking about, figurative verses plain, and why is this so important to His followers? In verse 27, Why does the Father love Jesus’ followers? Explain the relationship process! In verses 31-33, Explain Jesus’ message to His followers; You shall be scattered, each to his own? I am not alone? You may have peace – Where is this peace come from? In the world you will have tribulation? Be of good cheer? and, “I have overcome the world”? Write a short essay regarding your understanding and your insight of Chapter Sixteen, and what each highlighted point means to you. Chapter Seventeen - In the last of four chapters in this Gospel of John Jesus teaches his disciples through prayer to the God the Father in heaven. Jesus prays for Himself, for His disciples and for all those who believe in Him – Today Jesus prays for you and me, as children of the family of God through Jesus the Christ. ALL PRAISE HONOR AND GLORY BE TO GOD THE FATHER AND TO JESUS CHRIST THE SON AND THE HOLY SPIRIT, AMEN – HALELUHIA – AMEN! Chapter Seventeen Short Essay Questions. Analyze and discuss Jesus’ prayer for Himself to the Father in verses 1-5. What makes it unique? What are its elements? In verses 6-19, Jesus prays for His disciples. Analyze and discuss. What does Jesus say in verses 6-8 about His disciples of whom He prays for? In verse 9, What does Jesus mean? Who does He not pray for, and why? In verses 10-16, explain Jesus’ prayer? In verses 17-19, Sanctification is an essential concept in our journey of Faith and Jesus’ prayer. What is the doctrine of sanctification and why is it important to Jesus and the believers in Jesus the Christ? How does the Doctrine of Sanctification affect you as a believer? In verse 20-26, Explain Jesus’ prayer for all believers, His compassion, and His Passion for those who are lost and who receive as their Savior. What are His desires for all believers in verse 24, and what has Jesus done to insure all creation will know the Father in verses 25-26? Who are the believers in Jesus the Christ? Write a short essay regarding your understanding and your insight of Chapter Seventeen, and what each highlighted point means to you. Chapter Eighteen - In Chapter Eighteen the Apostle John records the story of Jesus' betrayal by one of His disciples Judas Iscariot; Jesus’ resulting arrest, persecution, and trials by Annas, Caiaphas the high priest and the Roman governor Pilate; the taking place of Barabbas; and the heartbreaking three denials of His disciple Peter – that he knew Jesus. Chapter Eighteen Short Essay Questions. In verses 1-2, What place near the Brook Kidron did Jesus and His disciples go to meet? Why? In verses 3-4, Who led the inquisition and arrest of Jesus, and who all came with him? Who provided all who came with Judas, and Why is it significant? Who were the crowds seeking in verse 7? What was Jesus’ response to them in verse 8, and why was it so? What did Simon Peter do in verse 10-11? What was Jesus’ response? In verses 12-13, To whom did they bring Jesus to first? In verse14, What was Caiaphas’ advise to the Jews, and Why is his advice significant? In verses 15-16, Who followed Jesus to the courtyard of the high priest, and who went with Him into the courtyard of the high priest? Why? What did Simon Peter do and say in verse 17-18? In verses 19-24, What did the high priest question Jesus about? What was Jesus’ response? Who struck Jesus, and why? Who then did Annas send Jesus to after questioning Him? In verses 25-27, What Simon Peter do and say? And, What happened immediately afterwards? In verses 28-32, To whom did the Jews bring Jesus to? Why would they not enter the Praetorium? What did they accuse Him of, and why would they not judge Him? What was Pilate’s response to the Jews? In verses 33-38, What was Pilates first question of Jesus, and what was Jesus’ response? What was Pilates second question of Jesus, and what was Jesus’ response? What was Pilates third question of Jesus, and what was Jesus’ response? What was Pilates fourth question of Jesus, and what was Jesus’ response? In verses 39-40, Why was Jesus substituted for another prisoner? Who was Jesus substituted for? What did the Jews demand of Pilate in verse 40? Write a short essay regarding your understanding and your insight of Chapter Eighteen, and what each highlighted point means to you. Chapter Nineteen - Chapter Nineteen of the Gospel of John provides us the Truth of Jesus' persecution and suffering, His brutal crucifixion, and His burial. Despite Jesus’ great anguish and inhumane suffering, Jesus ensures that his mother will be taken care of by asking His disciple whom He loved to take care of her – a continued act of selfless love and compassion, even in the midst of unbearable persecution. Chapter Nineteen Short Essay Questions. In verse 1-3, What is the significance of the twisted crown of thorns, and the purple robe which the soldiers place on Jesus? Why did they say, ‘Hail, King of the Jews!’ if they did not believe in Him? Does this mockery exist today? What was Pilate’s stand on Jesus’ guilt in verse 4-6? What did he tell the Jews and the crowds? In verses 7-16, What was the response of the Jews and the crowd to Pilate’s initial declaration? What did they cry out? What was Pilate’s response to Jesus? What was Jesus’ answer to Pilate? What did Pilate finally do, and Why? In verses 17-18, Where was Jesus crucified? With whom was He crucified? 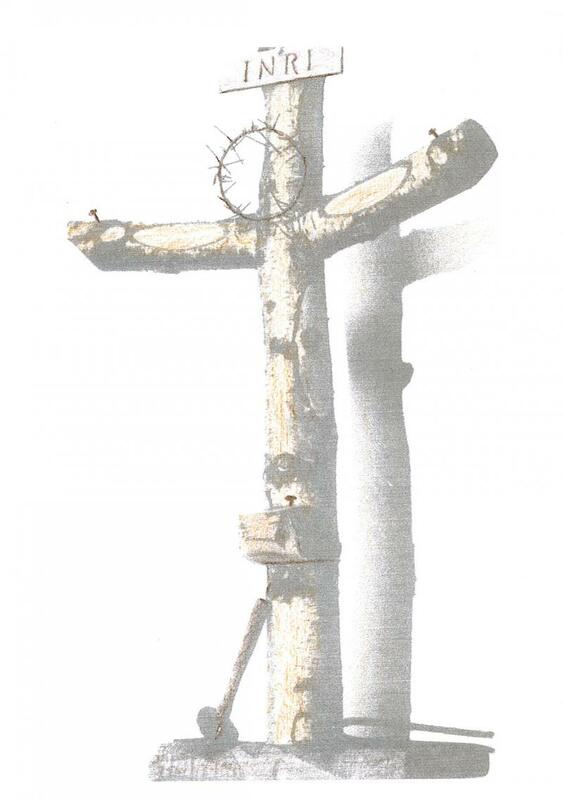 What was the significance of the placement of Jesus’ cross in relationship to the other two being crucified? In verses 19-22, What was the inscription that Pilate wrote and ordered place upon the cross of Jesus? What is the significance of this gesture by Pilate? How did the Jews react, and what was Pilate’s response to them? In verse 23-24, What did the soldiers do with Jesus’ garments and tunic, and why was this act by them significant? In verses 25-27, What is the significance of Jesus’ statement to the disciple He loved and His mother? Who was present at the cross? In verses 28-30, What does Jesus mean when He says, ‘It is Finished!’? What is finished, and what significance is it to all believers? In verse 31-37, What is Preparation Day? Why must the body of Jesus be removed and buried before the Sabbath? Why were Jesus’ bones not broken? Why was Jesus’ side pierced? In verses 39-42, Why was Jesus buried in a tomb in which no else who had died had been laid? Why is this significant? Write a short essay regarding your understanding and your insight of Chapter Nineteen, and what each highlighted point means to you. Chapter Twenty – Chapter Twenty not only contains the purpose of the Gospel of John at its conclusion, it also reveals the greatest account of victory ever told in history – victory over death - because “HE IS RISEN!”. Jesus the Christ was resurrected from the dead, and then appeared to Mary Magdalene and the disciples on three different occasions. The beautiful Gospel of John has been written that all may believe that Jesus is the Christ, the Son of God, and in believing they may have life everlasting! Chapter Twenty Short Essay Questions. In verses 1-2, What day was Jesus’ body discovered missing? Who discovered Jesus’ body missing? What did she do upon discovering Jesus’ body missing? In verses 3-10, Who were the two disciples that ran to the empty tomb where Jesus had lain? Who got to the tomb first? Who entered the tomb first? Where did they go afterwards? In verses 11-18, What did Mary Magdalene do after the two disciples of Jesus left the tomb? Whom did she see in white sitting at the head and feet where Jesus had laid? When she turned around, Whom did she see, yet did not recognize? What did the Man say to her in verses 15-17, and then what did she do? In verses19-20, What time of the day, and what day of the week was it that Jesus’ disciples were gathered? Why did they assemble behind closed doors? Who appeared to them, and what did He initially say? In verse 20, what did He do, and what was Jesus’ disciples response? In verses 21, What did Jesus say and reveal to them? In verse 22-23, What did Jesus do to His disciples, and say to them, and, what does this mean to all believers and followers of Jesus the Christ? In verses 24-28, What does Jesus say to Thomas about His belief and faith, and what is Thomas’ response? Inverse 29, Who are the blessed, according to Jesus? Why is this significant to all believers? Inverses 30-31, According the Gospel of John, why are these things written? Write a short essay regarding your understanding and your insight of Chapter Twenty, and what each highlighted point means to you. Chapter Twenty-One - Chapter Twenty-One of the Gospel of John reveals to us a third appearance of Jesus after his Resurrection, and the Restoration of Peter by Jesus, on the beach of the Sea of Galilee. This chapter reveals, as does the Gospel of John, that Jesus did many other things and signs and miracles which are too numerous to be written about, so many that the world could not contain a record of them. Chapter Twenty-One Short Essay Questions. In verses 1-3, Where did Jesus show Himself again for the third time to His disciples? Which disciples were present? What were they doing? Were they successful? In verses 4-6, Where did Jesus show Himself to His disciples? What did Jesus say to His disciples? What was their answer? What did Jesus tell His disciples to do? Did their obedience bring them success? In verses, 7-14, What did Jesus do for His disciples when they came to land? In verse 9, What does the number 153 represent? Where else in the Scriptures does Jesus feed His followers bread and fish? In verses 15-20, What was the purpose and significance of each of Jesus’ three questions to Simon Peter? Why were Peter’s responses important? What did Jesus ask Peter to do after each question? What is Jesus saying to Peter, after His third question in verse 18-19? Who is Jesus’ beloved disciple who stays behind to await Jesus’ return? Where in Scripture do we see him again in dialogue with Jesus the Christ, and for what purpose? Write a short essay regarding your understanding and your insight of Chapter Twenty-One, and what each highlighted point means to you. Summary Points as Recorded in the Gospel of John. Summary of Jesus the Christ’s Public Ministry as Recorded in the Gospel of John. Greek-English New Testament, Nestle-Aland, Copyright @1994, DEUTSCHE BIBELGESELLSCHAFT, Munster/Westpgalia. The New Interpreter’s Bible, A Commentary in Twelve Volumes, Volume IX Luke – John, Copyright @1995, Abingdon Press, Nashville. The Expositor’s Commentary, New International Version, Volume 9, John – Acts, Copyright @1981, The Zondervan Publishing House, Grand Rapids. A HARMONY OF THE GOSPELS FOR STUDNETS OF THE LIFE OF CHRIST, Robertson A. T., Copyright @1950, HARPER & BROTHERS PUBLISHERS, New York. If you need help with answers, or assistance, please write to us, or you can E-mail us at the below address!